Silver Dollar City is a top attraction in the Midwest. Each year it draws throngs of visitors to the Ozarks, so they can experience a mix of old-time crafts and new-age rides. 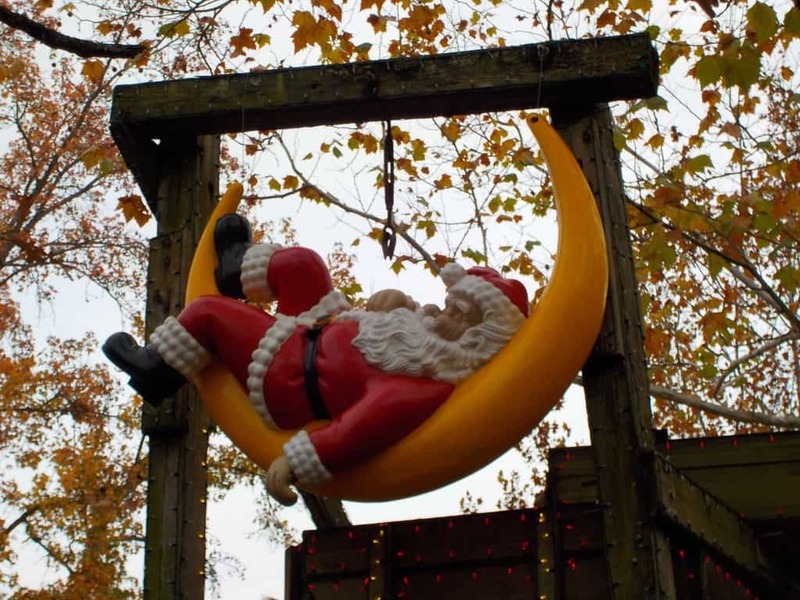 We, like many of you, have visited on multiple occasions, but we have never been to the Old Time Christmas Festival. Each Fall, the park is transformed, for the months of November and December, into a magical holiday experience. A purchase of tickets during a local fundraiser provided the perfect opportunity to finally see this extravaganza. Since we knew we would be experiencing a wide range of temperatures during our visit, we opted to prepay for Premium Parking ($13.00+tax). This allowed us to park within easy walking distance from the gates. It ended up being a bargain when compared to having to pay for a couple of lockers. (The lockers are limited in number, so a double good purchase.) We arrived just before opening, even though we had set out early. Be prepared for lines of traffic when you visit, as this is an extremely popular festival. Once we passed through security, we found ourselves deposited in the park. I am not one to leave too much up to chance, so I had pre-planned our day. The first part was still daylight hours, so the focus would be on riding anything that was appealing, as well as visiting the craftspeople. The park is laid out in a fairly circular fashion, so it’s not too difficult to see most everything in one pass. We decided to pass up a visit to Marvel Cave, since we have done that a couple of times in the past. We took a left, and headed toward the older section of the park. 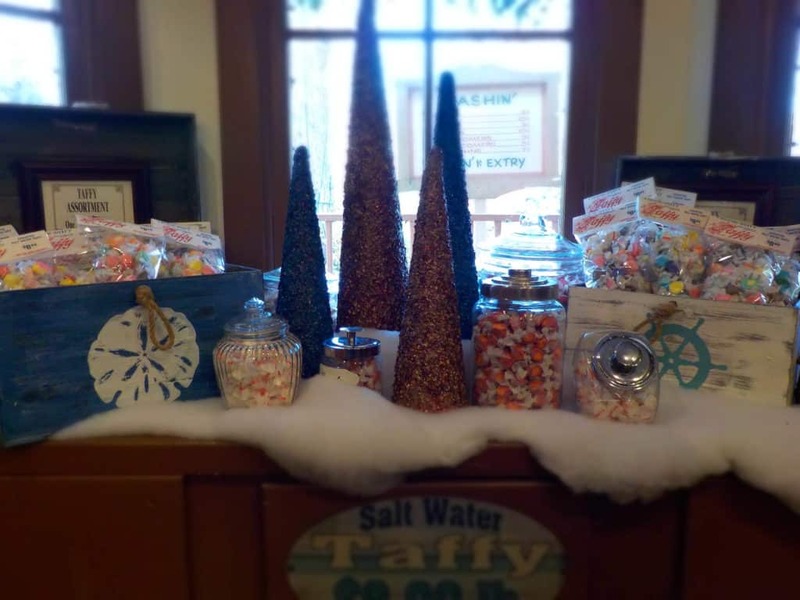 A stop in the Phoebe Snapp Taffy shop offered plenty of color and ambiance to set the tone for the day. As we stepped outside, the delicious aroma of freshly baked cinnamon rolls found its way to our noses. Stepping inside of Sullivan’s Mill, we watched the staff working away on the next batch. 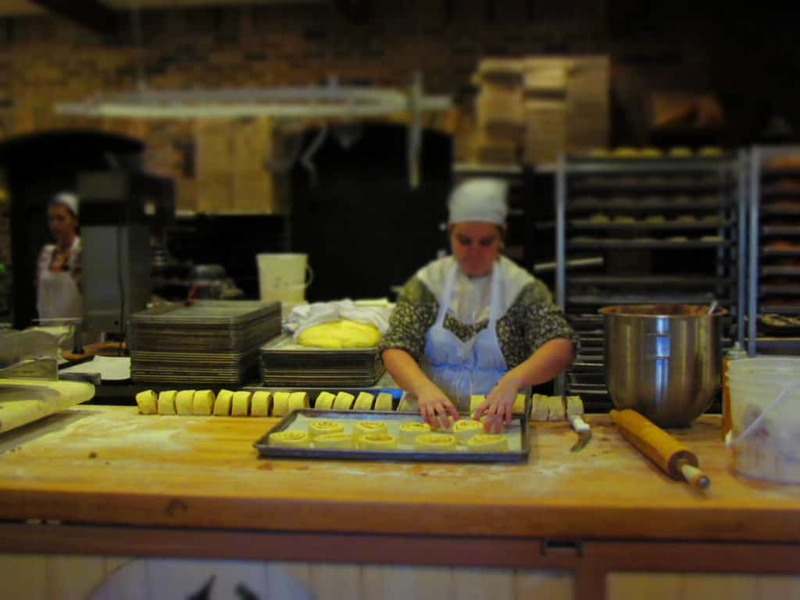 The scent of the baking pastries was so good, and reminded us that we hadn’t eaten in a while. Watching for a restaurant would have to be added to our list. We left the bakery, and outside found an assortment of buildings reminiscent to those that the settlers of the area may have constructed. 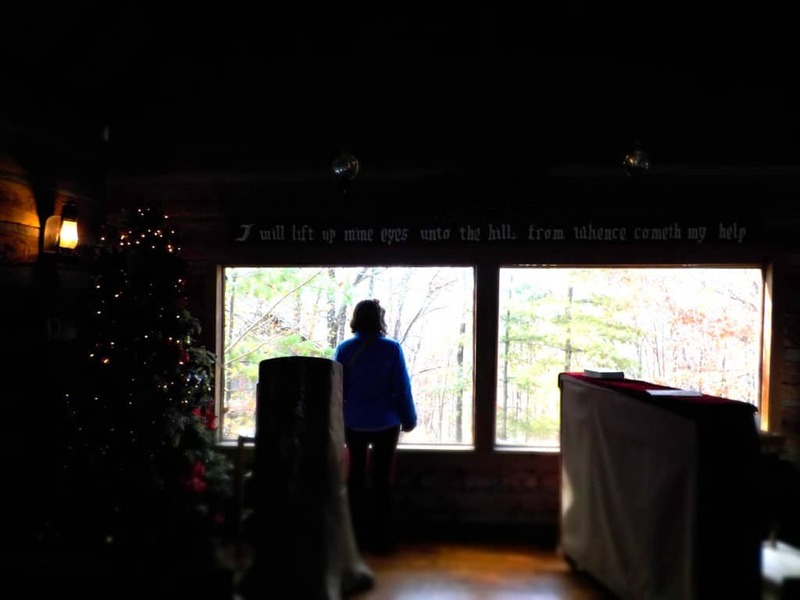 A must see is the Wilderness Church, which offers some magnificent views of the surrounding hills. It is a peaceful place for a few moments of rest. We started our way down the hillside, (Be prepared for plenty of climbing and descending in this park.) and ran across some crafts shops. Stepping inside the Mountain Leather Shop, we were immediately welcomed by the familiar smell of the tanned hides. With few expectations for finding items for our Christmas shopping list, we were able to focus on things for ourselves. While I saw a lot of neat things, nothing really jumped out at me to purchase. 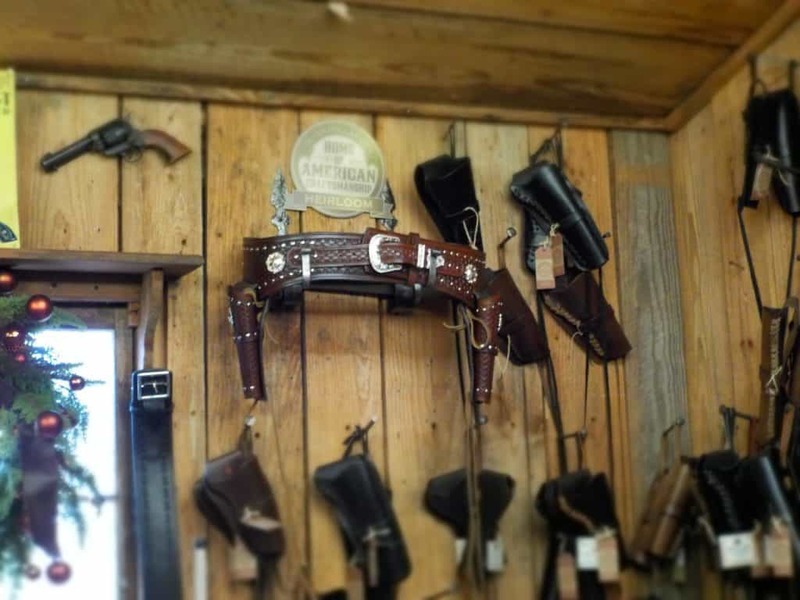 Perhaps if I was a cowboy on the range, I might find the need for a holster. We continued our downhill decent, and began hearing screams in the distance. With temperatures hovering around 50 degrees, we couldn’t believe that so many people would challenge the wind chill created on the roller coasters. It became apparent that our assumptions were wrong. We agreed that our decision to stick to indoor rides was a wise choice. At the bottom of the hill, we arrived at Fire In The Hole. This indoor roller coaster has a lower thrill level, but doesn’t involve loosing the feeling in your extremities. The line wasn’t too long, and soon we stepped aboard. The ride is dark, and the cars pass dioramas depicting the story of the Baldknobbers. If you have never heard of them, do yourself a favor and Google it. The only other ride we visited was The Flooded Mine. This indoor attraction travels at a much slower pace, and foregoes any quick movements. Passengers pile into ore cart shaped boats, which float through along a preset path. 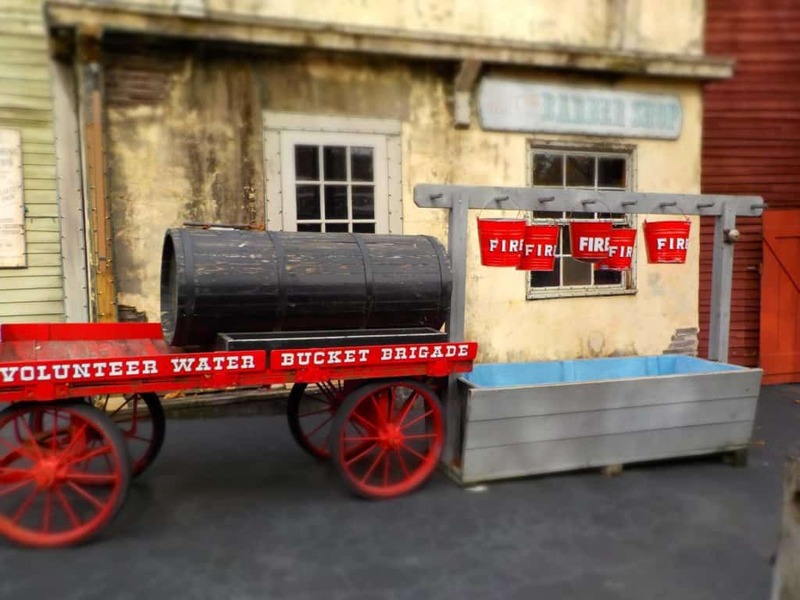 Along the way guests are entertained by a series of dioramas showing an underground mine that is in the process of flooding, The prisoners of the mine are setting plans in motion for a daring escape. This ride has an interactive feature by providing an arcade feel with the use of infrared guns for each visitor. In each of the dioramas there are a set of targets that, when hit with light, they set off an assortment of sounds and actions. We decided to just enjoy the ride, but found ourselves highly entertained by the kids in our boat. As we made our way toward the back of the park, we entered Santa Claus Lane. It’s fairly easy to identify, since there are a ton of Santa figures scattered all around. Here was another place that was enchanting to the children, of all ages. In the same part of the park we found Rudolph’s Christmas Town. This area offers some nice photo opportunities, so being kids at heart, we found a willing guest to take our picture. I believe the gingerbread sculptures are designed for kids a wee bit shorter than us, but it worked. Inside a nearby building, we found people waiting for a turn to pose with characters from the classic claymation show which the area is named for. 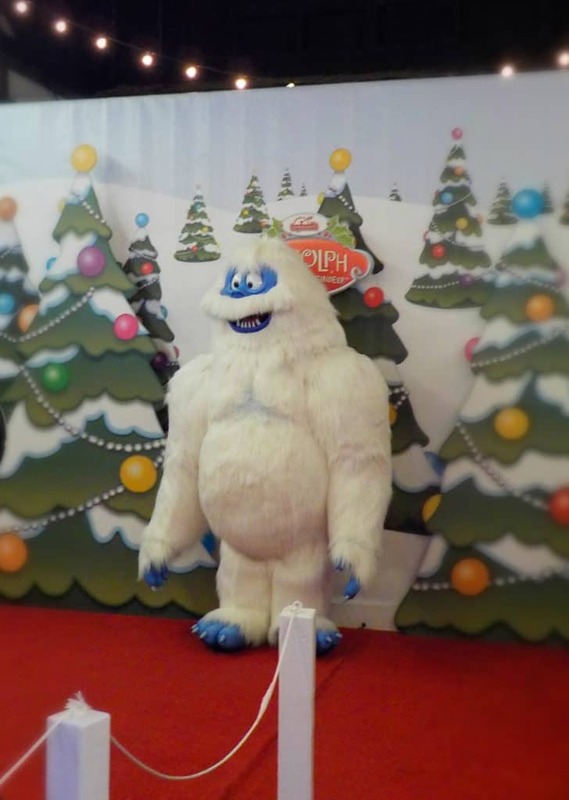 We decided against waiting in line, but if we had it would have been to pose with Bumble the abominable snow monster. Since the weather was less than desirable for rides, we decided to add a couple of shows to our schedule. The first one took place in the Silver Dollar Saloon. The show is called the Frontier Fa-la-La Follies, and runs for about 30 minutes. This old fashioned G-rated show is filled with a variety of short skits, and even includes some audience participation. 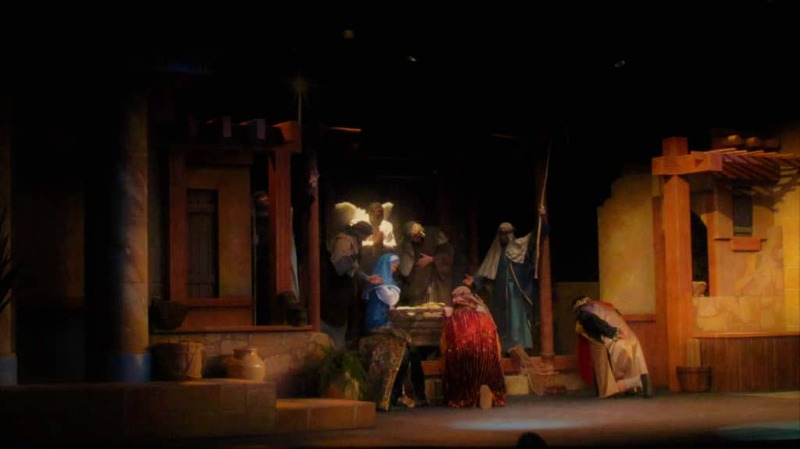 The second show we attended was The Living Nativity, which is held in the Riverfront Playhouse. The show is narrated, while actors play out the scenes leading up to the birth of Christ. It was a powerful performance, and well received by the audience. There are other shows that run during the festival, which we did not attend. A Dicken’s Christmas Carol and It’s A Wonderful Life are extremely popular with park guests. There are also some musical performances scattered throughout the park, but we enjoyed the Christmas songs which were being played over the outdoor speakers. As dusk approached, our anticipation for the light displays grew. After so many years of waiting, I know that Crystal was anxious. A trip to the car gave us an opportunity to switch cameras for the evening. As darkness crept up, we started seeing the outlined buildings highlighted in twinkling lights. The displays are found everywhere in the park. 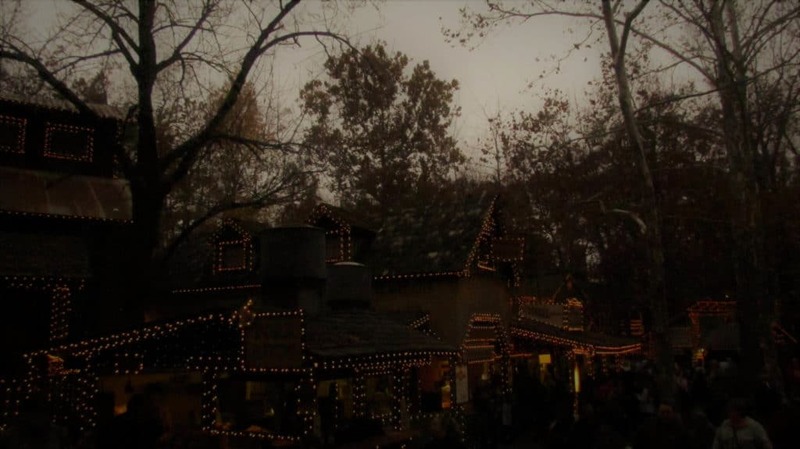 We had seen the advertisements stating that Silver Dollar City had added about 1.5 million lights from the previous year. These were added to the 5 million that were already in use. It is hard to fathom the idea of 6.5 million lights, and I was wondering how they could all be packed into the park. What we discovered were that many were used to create small dioramas, like a set of trees that change color right before your eyes. As the darkness deepened, we walked through the park admiring the displays. Many of the buildings are completely covered with sheets of lights. Over 1000 Christmas trees dot the park, and each one has its own set of lights. We both were wondering how long it takes to put up such an extensive display. The center of the park is filled with a light exhibit titled Christmas in Midtown. As we approached from the back of the park, we started to understand how they packed the unbelievable number of lights into the park. As we climbed the hill, a massive display came into view. Lights are everywhere you look. It is difficult to even describe it, let alone take it all in. It seemed like every inch of space was plastered with lights, and there are even a lot of hanging displays. We decided the best approach was to walk a little ways, and then just stop and look all around us. Even doing this, we are certain we missed a lot. The Christmas at Midtown display is over the top. There are a few light tunnels that guests can walk through, and are quite often filled with people taking selfies. We spent quite a lot of time in this area, but finally the chill gave us reason to return to the shops. The rest of our visit was spent as a mix between indoor and outdoor activities. We visited more shops, and enjoyed looking at the various Christmas displays. As the park hours were ending, we made our way back to our car to head back to our hotel. The purpose of our visit to Branson, Missouri had been to experience the Old Time Christmas Festival, and we could now mark it off our list. 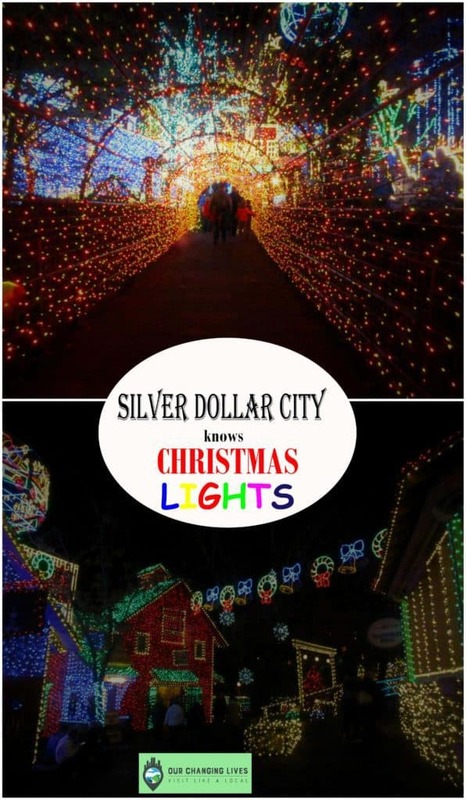 How many of you have experienced this over-the-top light display at Silver Dollar City?